Offering guided canoe and sea kayak trips on the Saugeen River, the Rankin River and Lake Huron. Based in Southampton. Online store for canoe, kayak, and camping gear. Prices in Canadian funds. Outdoor lifestyles shop with a full adventure program - paddling on the Saugeen River and Lake Huron with full outfitting and shuttle service, cycling, birding, and ski and snowshoe trails. Only outfitters on Saganaga Lake. Direct access to the Boundary Waters Canoe Area and Quetico Park. End of the Gunflint Trail. At the end of the Gunflint Trail, 55 miles from Grand Marais. Canoe outfitters for your trip to the BWCAW or Quetico. Housekeeping cabins on Seagull and Saganaga Lakes. Open mid-May through late September. Outfitters and 50-site canoe access only campground in the Superior National Forest. Price lists, details on camping facilities, used equipment for sale, BWCA links, contact information. Outfitters for the Boundary Waters canoe area. Provides information on reservations, equipment available for outfitting, suggested routes, rates and services, food, fishing trips, and transportation. Located in Ely. Outfitters based near the Boundary Waters Canoe Area. Includes price list, newsletter, information about the Sawbill Lake Campground and related links. Located in Tofte. A directory listing of Minnesota canoe outfitters and guides for the Boundary Waters. Packtrips in and around Yellowstone Park. Offers guided wilderness paddling adventures. Canoeing, hiking, and camping outfitting in Algonquin Park. River guides to the waters near Stokesdale, NC. Also offers outfitting and gear. Elizabethtown retailer providing sales and service of new and used bikes, accessories and clothing. Guided hunts for pheasant, hungarian partridge, water fowl, turkey, and deer. Offers horse training, riding, packing, and camping in pre-1840ÃƒÂ¢Ã¢â€šÂ¬Ã¢â€žÂ¢s Jackson Hole. Offers biking, hiking, kayaking and climbing excursions. Details and rates are provided. Offers canoe and kayak sales, adventure programs, and rentals. Store based in Indianola. Offers either single- or multi-day helicopter and cat skiing packages in the Monashee Mountains of British Columbia. Rides through the hills and along the river in scenic areas of Nebraska. Information, directions, and reservation instructions. Offers free advice along with complete outfitting. Services, profile, rates, and contacts. Canoe and kayak rental on the Upper St. Croix and Namekagon Rivers. Campground and multi-day trips available. Offers canoeing and kayaking trips along the Chestatee and Etowah Rivers in northern Georgia. Tubing outings also available. Offers information on canoe and kayak trips on the French Broad River, in the Blue Ridge Mountains. If the business hours of Thorncrest Outfitters in may vary on holidays like Valentine’s Day, Washington’s Birthday, St. Patrick’s Day, Easter, Easter eve and Mother’s day. We display standard opening hours and price ranges in our profile site. We recommend to check out thorncrestoutfitters.com/ for further information. 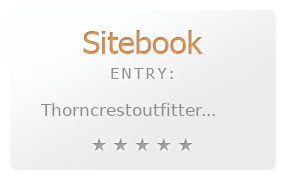 You can also search for Alternatives for thorncrestoutfitters.com/ on our Review Site Sitebook.org All trademarks are the property of their respective owners. If we should delete this entry, please send us a short E-Mail.